319. Compensation balance. t, a, t', is the main bar of balance, with timing screws for regulation at the ends. t and t' are two compound bars, of which the outside is brass and the inside steel, carrying weights, b, b'. 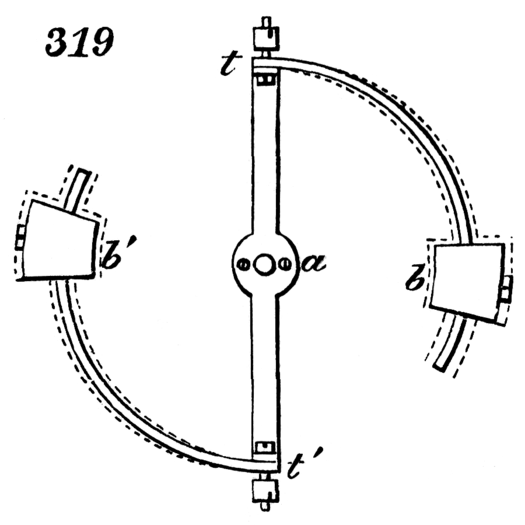 As heat increases, these bars are bent inward by the greater expansion of the brass, and the weights are thus drawn inward, diminishing the inertia of the balance. As the heat diminishes, an opposite effect is produced. This balance compensates both for its own expansion and contraction, and that of the balance-spring.